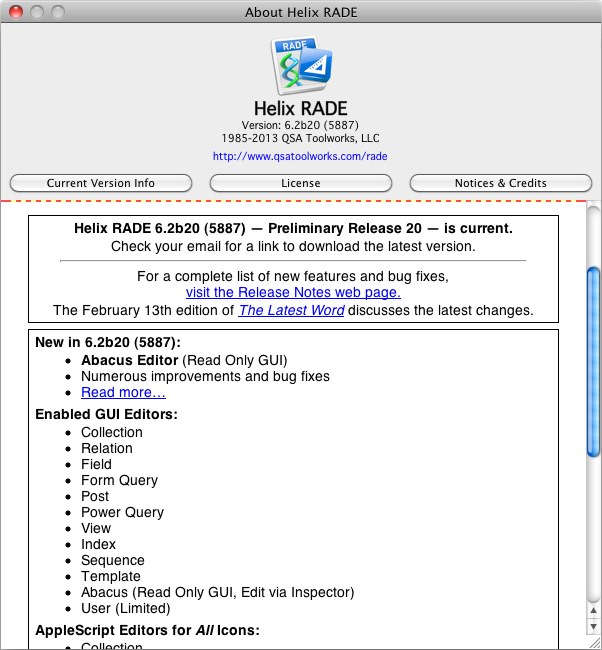 13 February 2013 — Excellent progress continues with the twentieth Preliminary Release of Helix RADE 6.2 for macOS available today. Subscribers to the Europa Pioneer Plan should receive an email today containing a link to the latest update. You can also get it by logging in to our web store and checking the download link listed in your current licenses. If you are a subscriber and you aren’t receiving the monthly emails, please contact us so we can determine why. For those who haven’t joined us yet, the monthly subscription option has come to an end. But you can still pay $440.00 and get every update we release through May 31, 2013. We’re still committed to monthly releases, so that’s 3 more updates delivered to you automatically. The installation process remains the same: mount the installer disk image, drag the new Helix RADE onto the Applications folder and let go. 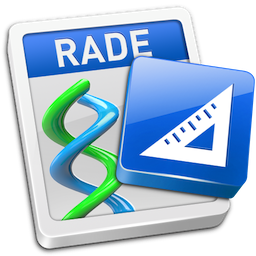 If you are updating from an earlier version of Europa, you can also double click the Install Update icon to quickly install the new version of Helix RADE. On more than a few occasions these past several years, we have likened the journey from Helix 5.3 to 6.2 to a physical trek over mountains and valleys. Like all explorers, we had no idea how many of these ups and downs lay ahead of us when we first set out, no idea of how long or how difficult each successive climb might be. We knew only that the alternative to pressing on was giving up, and as we have noted on more than a few occasions, we passed that fork in the road a long time ago. This close to the finish is simply not the time to consider such an option, especially one that runs so contrary to our nature. One key difference between our team and the explorers of old has, however, worked in our favor nearly every step of the way: our familiarity with the terrain we had to cover. Our mission was not merely to arrive at our ultimate destinationseeing Helix RADE run natively in macOSbut to transform the path as we went, easing the journey for those who would come after us. Whether climbing simply to reach a summit, or ‘just’ to test one’s skills on a difficult face, a mountaineer knows there is much workand dangerinvolved. Ascending is treacherous business, but descending also has its share of harsh conditions. You must remain in control; lose focus on your objective, and you may not reach it safely. Each summit has presented a vision of the next valley below, where we could gather our resources and relax just a bit before pressing on. But it has also clearly shown us the next peak in the distance. The joy of conquest has thus always been short lived, yet we’ve tried to share that joy by providing new Helix updates along with our monthly progress reports, showing you how far we’ve come. And that is precisely what we’re doing today: giving you your long-awaited first look at RADE’s macOS abacus editor. Like the template editor, the abacus editor is a mountain too high to scale in a single month. So we’ve set up our base camp part-way up its face, at a point where you can now open the abacus editor window and see the tiles and icons within. We’ll leave you with this breathtaking view while we push on, up to the summit (making it editable) and then down the far side (fixing the inevitable bugs). Hopefully, next month’s release will find us making our final ascent. And when we finally do arrive in the fertile valley on the other side of that peak, we can look back at the journey and hopefully consider it worthy of the effort. Until then, we must press on no matter how harsh the conditions may become. The abacus is certainly all of those things. Indeed, when some people were clamoring for the return of icon view, some mistakenly believed that we were referring to the mountain we are now ascending. The abacus editor, after all, involves a significant amount of icon dragging. What is it to create (or edit) an abacus? You start with an empty window to which you add tiles and icons in a series that forms the logic of a calculation that is done with the data users enter into fields. We de-mystified the magic of the abacus somewhat when we introduced the Abacus Expression Language (AEL) which exposes the syntax of a calculation in a form that programmers using other languages immediately recognized and embraced. We introduced AEL way back in Preliminary Release 7 so, technically, you’ve been able to create and edit abaci for over a year. But Helix’s heart and soul is its graphic interface, and using a text-based language to create an abacus rubs against that grain. Besides, the using the AEL simply isn’t as much fun as dragging tiles and arrows around. 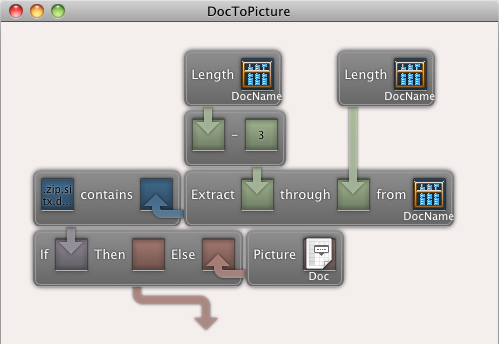 With Preliminary Release 20, finally, visual abacus editing is nearly restored. Like the template editor, the abacus editor opens into its own window, just as it did in Classic RADE. However, as with the macOS template editor, the tiles and icons that go into an abacus are no longer affixed to the side of the editor; they will come from the Element Panel, the Inspector, the collection and relation windows. The first time you open one of your old abaci, you may be confused by a couple of things. If the abacus you open was created or modified using the AEL, the first thing you will notice is that some of its tiles are not visible because all of its tiles appear piled up on top of each other in the upper left corner of the window. Until this release, AEL paid no attention to where it put the tiles, simply stacking them all up in a single location. If you see this, don’t panic: we’ve already solved the problem with a great new feature that will bring much-needed clarity to the most contorted of tile layouts. It’s an extension of the old “Clean Up” command active in the collection and relation windows. With an abacus editor window active, the Icon menu shows a new command: Align Left. Choose it and the tiles are rearranged in a ‘left-leaning’ cascade that eliminates 99.9% of the ‘crossover’ arrows and tile overlaps. Hold down the Shift key and the command changes to Align Right for users who prefer ‘right-leaning’ arrangements. And if you add the Option key to either alignment, you get an alignment ‘with Overlap’ that compacts the layout with a subtle overlap of some of the tiles. We’re hoping that each Helix user will find that at least one of these four alignment options will appeal to them. We’ve also tied this automatic alignment feature into AEL, so editing an abacus that way will no longer result in the aforementioned tile pile ups. The second thing you may notice is that colorful things are going on inside the abacus editor. The ‘black holes’ in the abacus tiles are no longer black and the arrows, in addition to being a little curvier, are now also colored. Even the background of an abacus window has a slight tint of color from the same family as the output arrow. This isn’t meaningless window dressing. Each color represents one of the eight datatypes in Helix. Text data is blue, dates are yellow, numbers are green, and so on. 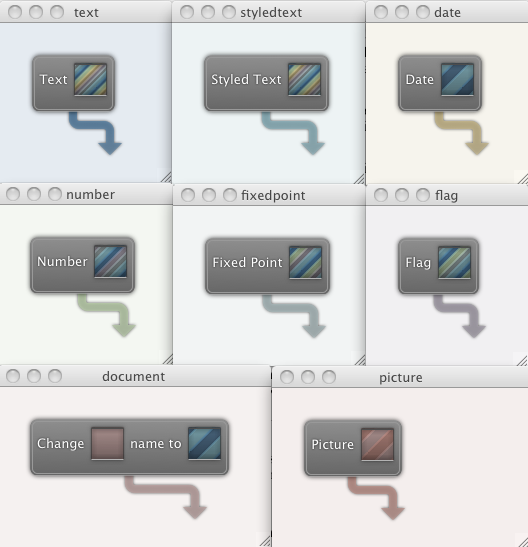 The image on the right shows the default colors for all eight datatypes. We’ve tried to make them fairly logical (text and styled text are similar datatypes, so the colors are similar) and somewhat muted. If you don’t like them, bear with us: a future release will give you the ability to define your own color set, or to turn them off entirely. You will probably also notice that in most of the holes there is not just one color, but a rainbow of color. In a situation where a tile can receive more than one datatype, each datatype’s color is represented. For example, the Date tile only accepts text and styled text data, so the hole contains just the two shades of blue that represent those datatypes. But a Flag tile can accept four datatypes (text, styled text, number, fixed point) and so it shows four bands of color. The Text tile can transform a variety of input types to text, so the hole reflects all six datatypes that it accepts. For each of these datatype conversion tiles, the output arrow is a single color, which indicates the datatype that results. During construction, some tiles can result in various datatypes, and so in that case the arrow is multi-colored to provide another visual clue, but ultimately, a completed abacus produces just one datatype, and the ‘dangling’ arrow tells which datatype it is by its color. The background of the editor window is also slightly tinted using a lighter shade of that same color. This new feature also helps to address one of the most problematic aspects of modifying an abacus in Helix. When making a change, you always had to know in advance whether an arrow would be accepted by a black hole before you attempted to add it. If it worked, all was right with the world. But if it failed, it could set off a cascade of disaster. If that abacus was used in another abacus or in a post, that icon would become invalid as well. That wasn’t really so bad, because once you completed the changes, those icons would usually revalidate and return to normal operation, But if that abacus was used as a defaulted value on a template, it would be completely removed from the rectangle, causing the view to function incorrectly. And if that abacus was used in a query, the pre-defined query statement would be wiped out. If any of this happened, Helix would beep and offer a Why? message that provided only a vague hint of what may have been changed. Depending upon how intertwined the collection structure, one slip could undo more things than you could possibly remember to fix. Experienced developers devised numerous ways of working around this slippery slope, but it cried out for a better solution. We’ve helped to alleviate this issue with two new features, the first of which is the aforementioned color representation of each datatype. In this second image, notice that the color of the arrow in each hole is the same color as the hole itself. So, now, if you are not sure if dragging an arrow into a hole will tear up your nice work, make sure the colors match first and everything will be fine. The second change that resolves this problem is the new “Commit/Revert” strategy that is now applied to all Helix icons. In Classic Helix RADE, the changes you made were immediately applied, causing even simple, well-thought-out changes to be as likely to trigger invalidations as the most haphazard approach. But now you can fearlessly make as many changes as you want. When you are satisfied with the new arrangement, Commit the changes andas long as you haven’t changed the output datatypethe new expression seamlessly replaces the old one. And if you decide you need to scrap the changes and start over, you can Revert to discard the changes. If any of this new capability disturbs you, just keep in mind that when we complete this task, the abacus editor will still do exactly what it always did, only now, it does it better. For more details on the new abacus editor, as well as information on the obstacles we had to overcome (i.e., bugs) to get here, see the Preliminary Release 20 Release Notes page. In the December 2012 edition of The Latest Word we made an announcement that was long-dreaded by some. Whether because it was hidden in with a bunch of good news, or because it was subconsciously blocked from memory, some folks didn’t notice it then, so we’re compelled to restate it here. At more than one point during the Europa Pioneer Program, we indicated that we would have to withdraw support for the PowerPC at some point. That point had been defined as when we have to decide between forging ahead or correcting a problem that only occurs on the PowerPC platform. As it turns out, it wasn’t a point, per se, but rather an accumulation of such points. As we are able to work almost exclusively in macOS RADE now, our minimal PowerPC testing turns up new annoyances on a regular basis. It has been over seven years since Apple made the switch to Intel, and we’re not in a position to dwell on the past, so we encourage you: if you don’t have an Intel Mac yet, it’s time. Starting in December, the Preliminary Releases have been delivered for Intel Macs only, but we continued to make the Interim builds available for PowerPC users as well. That chapter is now coming to an end as well, and so Interim Build 5887 is the last version of Helix RADE 6.2 that will run on a PowerPC Mac. We’re also considering dropping support for macOS 10.4, which just barely runs on Intel Macs. If you’ve got an Intel Mac and you can't upgrade to 10.5 or later for some reason, let us know about it. We’ve encountered a couple of places where it would be faster and easier for us to support macOS 10.5 and later, so if we don’t hear any objections, the next time the situation presents itself, we’ll drop support for macOS 10.4. Only three (3) iterations of RADE 6.2 remain before the end of the Europa Pioneer Program’s second year. At that time, while it is our hope that conversion of RADE from Classic to macOS will be complete, we know that the work on making the RADE of the future will just be beginning. In today’s release, you can at last open and inspect an abacus, but the only way you can create or modify one now is using the Abacus Expression Language (AEL) in the Inspector or via AppleScript. On March 10th, we expect to have the abacus editor completed, allowing you to drag tiles and icons around with a mouse once again. This two-part approach is how we delivered the template editor, and that worked out quite well. When the abacus editor work is complete, we tackle the last peak: the user editor. Once we’ve rappelled down the far side of that mountain, we’d like to go back and polish up a few rough edges before dropping the “Preliminary Release” moniker forever. Regardless of where we are on or about May 31st, the second year of the Europa Pioneer Plan will end with that release. Those who paid to participate and remained current will own the product and not be expected to pay any more for it, even if it ends up taking us a little longer to finish. No matter what happens, you can rest assured that we are not simply going to draw a line under what we have on May 31st and say it is finished if it isn’t. And if the past has taught us anything in addition to eternal vigilance, it is that after it finally is complete, there will be maintenance releases to fix bugs as yet unencountered and refine functions and features in need of refinement. Please remember, even at this late date, that we still need all the financial help we can get to finish this job, and that you can still both help and save yourself some money by getting on board before Europa is finished. It’s getting very close to the time when the Europa Pioneer’s discount will end. In the meantime, thank you all for hanging on. We’re continuing the great progress we made last year and we look forward to moving forward in 2013 with a Helix for now and the future.